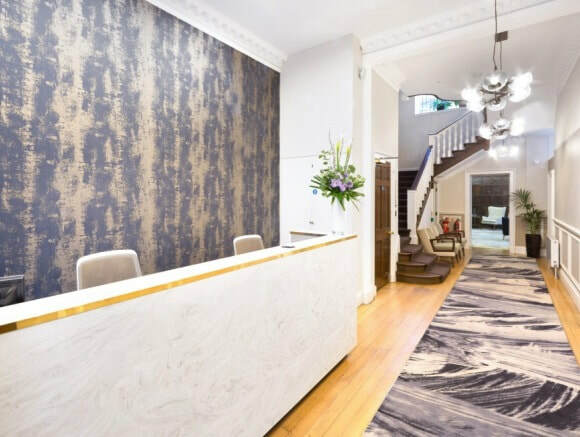 Devonshire Street office space offers a wide range of special features that include a helpful staffed reception and meeting room facilities that can be hired by the hour. The building is situated in the W1 region of London and has a choice of tube stations to choose from close by including Great Portland Street, Warren Street and Regents Park. The business centre itself has a range of serviced offices to rent in various sizes, which are fully furnished with desks, chairs, storage cabinets, and phone handsets. With no upfront deposit required, these office suites also have twenty-four hour access and are pre-cabled with a super-fast internet.